The way this summer has gone, it looked like there never was going to be a good time to try out my idea for adult versions of the commercial (and trademarked) Popsicle. But the weather seems to have settled into a nice run of warm days at last and I’ve been experimenting with making ice pops with a kick. These frozen bars are milder versions of a couple of refreshing summer cocktails made with fresh juice. It took a little tweaking to get the flavor right while reducing the alcohol enough that the pops would freeze. They’re supposed to be fun, not seriously intoxicating, anyway. For my models, I drew on Lynchburg Lemonade, named after the Kentucky home of the Jack Daniels distillery, and a generic peach daiquiri recipe. I substituted lemon juice and homemade simple syrup for sour mix in the potent lemonade recipe and stuck to fresh peaches rather than “peach-flavored” liqueurs in the daiquiri. The results are fresh tasting and fruity–with just enough liquor to make the flavors more interesting. These are easy to whirl together in the blender and freeze in the ice pops molds readily available in most cookware stores these days. Let them freeze overnight and you’re ready for an impromptu party, complete with frozen drinks. In a small pan, bring sugar and water to a boil. Let boil 5 minutes, then set aside to cool. Place sugar syrup, lemon juice, whiskey, triple sec and tangerine juice into a blender and whirl together until well mixed. 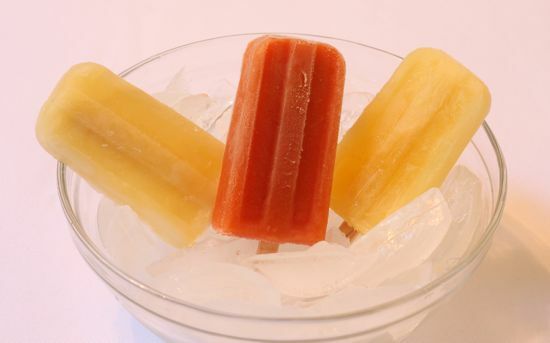 Pour mixture into ice pop molds, leaving about ½ -inch of headroom to allow pops to expand as they freeze. Insert wooden sticks immediately if the molds have tops. Or wait about 30 minutes after placing in the freezer until the pops become slushy enough for the sticks to stand up straight. Let freeze overnight. When ready to serve, run warm water over the molds just until the ice pops release. Whirl all ingredients together in a blender and pour mixture into ice pop molds, leaving about &frad12 inch of headroom to allow the pops to expand as they freeze. Insert wooden sticks immediately if the molds have tops. Or wait about 30 minutes after placing in the freezer, until the pops become slushy enough for the sticks to stand up straight. Let freeze overnight. I’m on my way …. good timing w Irene coming up the east coast …. to the beach (Chincoteague). Where do I find the ice pop molds?